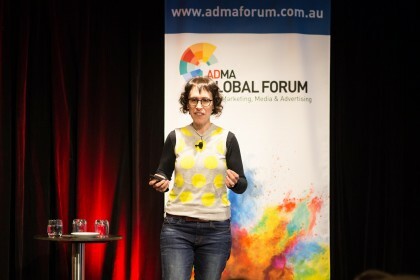 During the ADMA Global Forum, Innovation psychologist Dr Amantha Imber shared three practical techniques to help drive innovative thinking and start the innovation clogs ticking within a business. Imber, founder of innovation consultancy Inventium, discussed the science behind innovation and how it can relate to brands and marketing. “If you think about any kind of challenge that you’re trying to solve, what will be sitting in the back of your head are assumptions,” Imber said. “They can be real, like budgetary ones or they can be perceived, just things that we think. But what assumptions essentially do is they fence in our thinking. An examples of a brand that has crushed assumptions: Apple iPhone changing the mobile phone interface. “We can’t help but solve problems from our own point of view,” Imber said. “The problem with that is if we’re solving things from the same point of view, we’re generally going to come up with similar kinds of solutions because it’s through the same lens. “With every single decision we make over the course of a day, whether big or small, it eats away at your cognitive resources,” Imber said. “The more decisions you make over the course of a day, the worse the quality of those decisions becomes.